J Street San Diego Presents: 1913: "Seeds of Conflict"
J Street San Diego is sponsoring the San Diego premiere of the film 1913: Seeds of Conflict. WHEN: Monday, June 15 at 6:30 p.m.
We'll be hosting a live discussion featuring award-winning filmmaker Ben Loeterman and film scholar Professor Lawrence Baron following the screening. Breaking new ground and laying bare old myths, the film explores the little-known history of Palestine during the latter part of the Ottoman Empire, a time of relative harmony between Arabs and Jews. 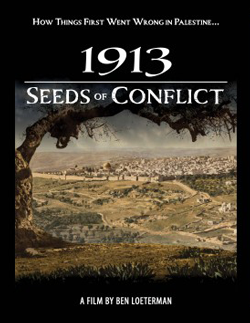 Weaving the raveled threads of Arab and Jewish narratives back together, 1913: Seeds of Conflict provides new and fascinating insights into events that took place in Palestine, which presaged a century of unrest. The film examines the divergent social forces growing in Palestine before World War I that fueled the rise of Jewish and Arab nationalism.